Cardano sees itself as a third-generation blockchain network that will solve problems that currently frustrate the blockchain space, while ensuring that its technology is peer-reviewed and implemented in a high assurance manner. The project is ambitious and intends to tackle problems of scalability, interoperability, and sustainability. To achieve its goals, the Cardano project is proposing a layered architecture where it splits its stack into two layers, which will function in a coupled manner, but maintained as two distinct parts of the system. The token of the Cardano blockchain is called ADA, the token on the ADA blockchain will serve the dual purpose of being a medium of exchange as well as the method of payment for the transactions fees. The full details of the ADA token can be found here. However, this is a quick breakdown of the capital structure of the project. Given the fact that IOHK is contracted till 2020 to build the Cardano blockchain, we can estimate that the annual burn rate is around $12million. IOHK has more than 30 listed employees last working on Cardano and Daedalus. Additionally, the Cardano foundation has 6 staff listed on its website. This leads me to believe they are forecasting moderate expansion given their estimated burn rate and their current team size. 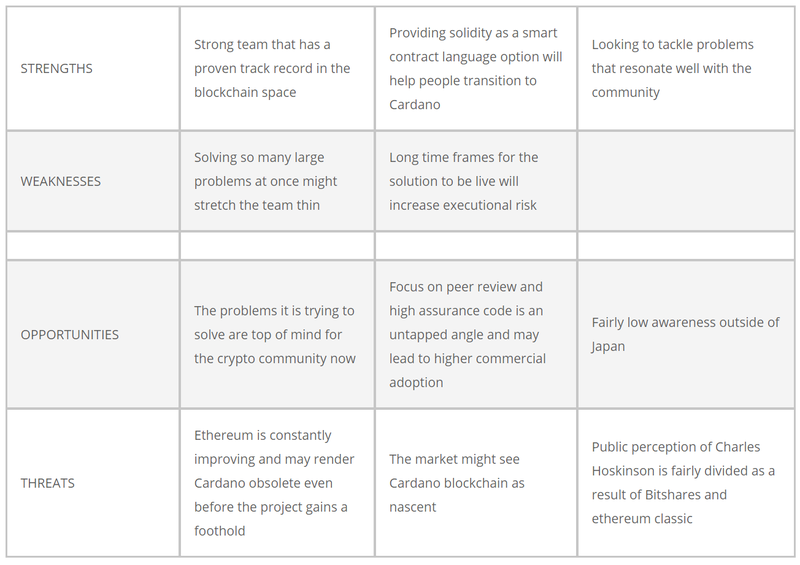 Cardano has identified several main issues facing the blockchain space and has laid out a roadmap to address all of them. The problems in question are scalability, interoperability and sustainability. The Cardano project has its sights set on a very ambitious market — the entire blockchain industry. In that sense, the size of the market they are attempting to conquer is not only large but growing. The largest cryptocurrency, Bitcoin, has a market capitalization of $160 billion. While these are what I consider the main points of the project, it is only scratching the surface of what Cardano is trying to achieve. A large part of the project is to achieve all of these while making sure that their ideas are peer-reviewed and implemented in a high assurance way. There are a few primary uses to the Cardano token, the first of which is to serve as a store of value. With the Cardano project looking to offer native features such as “shop with Cardano” which is a credit card service, the store of value use case is fairly clear. The second use case of the token is protocol governance through staking and voting. As discussed earlier, Cardano will be running the Ouroboros protocol which is similar to DPoS and will allow users be part of the consensus mechanism by staking their ADA with trusted parties. The third use case is to pay for fees on the Cardano network. Just like Ethereum, Cardano has a gas mechanic as a means for users to pay for the computing power on CCL. ADA models Bitcoin in the sense that there is a finite supply (45 billion ADA) and a circulating supply that is currently lower than that. ADA will be given out as reward to people who mint blocks on their blockchain. The token can only gain value through pure supply and demand of the token given that no tokens are burnt as part of normal network operation. While the Cardano blockchain and Daedalus wallet are already up and running, the work is far from done. The version as of the time of this writing does not have most of the features of the project such as staking. In fact, it would not be wrong to call the current version of the Cardano blockchain an MVP. Shelley will be a very significant update for Cardano as it allows the community to start staking and be part of the consensus mechanism, thereby decentralizing the project. But that is just scratching the surface as Shelley will also contain many other upgrades to Cardano that will improve security and usability at the same time. It should be noted that it does not seem like Cardano is looking to compete with any of the other blockchains head-on by offering the same blockchain but improved. Instead, Cardano is looking to capture the market but releasing what they think a blockchain should be by tackling the problems discussed earlier from the ground up. In my opinion, Cardano’s biggest competitor is probably Ethereum. However, Cardano’s focus on peer review, high assurance code, interoperability, and sustainability gives Cardano a solid chance against the incumbent Ethereum as long as the project can deliver on its roadmap in the timely fashion. The project has a slightly different model where IOHK is contracted the build out the blockchain. As a result, I will consider the IOHK core team as part of the Cardano core team as well. 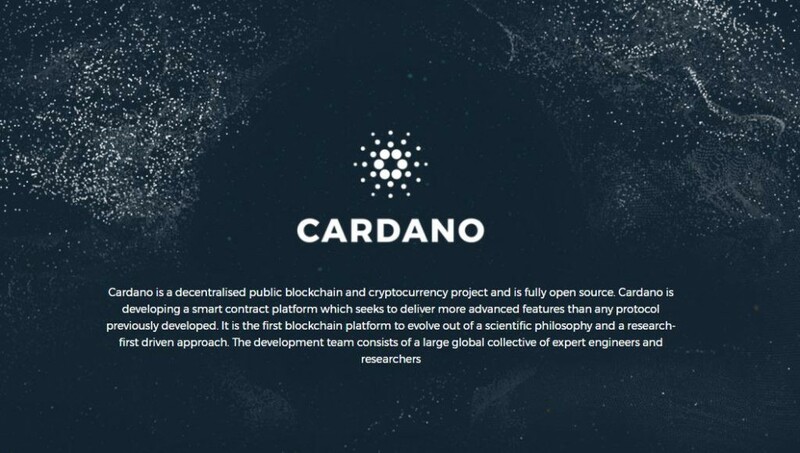 The Cardano project has a large and prominent team with Charles Hoskinson being their key member. Charles was the CEO of both Bitshares and Ethereum, and now functions as the CEO of IOHK. Besides Charles, the IOHK team consists of many subject matter experts in the areas of computer science, game theory, cybersecurity, and more. It should be noted that Cardano does not seem to have any listed advisors. However, given IOHK’s employee count, this may not be a factor. The numbers look quite healthy especially if you take into consideration that Cardano’s main-net launch happened only in September. With that said, Cardano did have a fairly lengthy token sale. Cardano is a hugely ambitious project with a great team and a unique approach. As it stands, the project is very transparent about its development and its operations which increases community trust in their project. While the project has a fairly large market cap, there is still huge upside if it can deliver on its promised roadmap. As it stands, the awareness around Cardano is still fairly low. However, this is changing, and we see increased coverage and chatter around Cardano. This is not investment advice. I have a position in Cardano as well as most of the other cryptocurrencies discussed in this review.